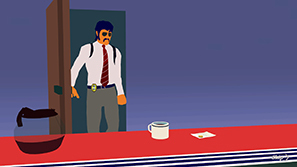 I first encountered LA Cops at Radius Festival a couple months ago and although I didn't get to play it, I was thoroughly impressed with the visuals and design. Since then I have been greatly anticipating playing it myself. I bought it several days after Early Access release on Steam and was very disappointed with many aspects. At that point there was only one (multi-tiered) level. 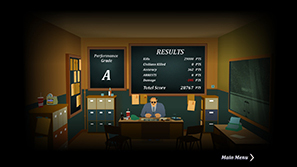 Now, LA Cops has been updated with two more levels and I revisited it to see how it plays now. 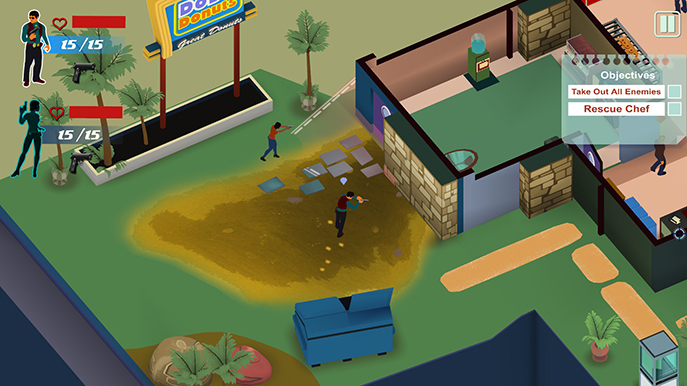 LA Cops plays similarly to Hotline Miami. You use the right analogue or mouse to aim in a three-hundred and sixty degree angle around yourself and are tasked with killing all the enemies on a floor before progressing. 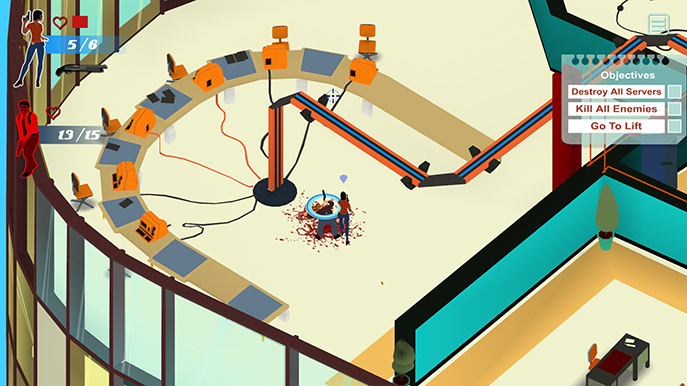 There are small missions in certain levels but these involve destroying a number of objects. 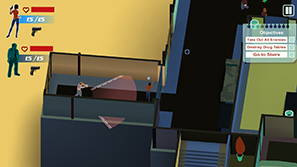 The levels are split into rooms and you can plan your elimination of the enemy carefully and efficiently to ensure survival and success. Unfortunately, there are several things out of your control that hinder you at every turn. You choose two of the LA Cops to go into each level with. You control one while the other remains stuck to the spot and can switch between them at any time. If your character dies you are automatically given control of the other and have a second shot at completing the level. When both die you start the floor from the beginning. There is some frustration from failing at the last and having to repeat the level, but that's fine; it's part of the genre. The visual design is the high point of the game so far. Bright and contrasting colours line the halls of the buildings and being able to fully rotate the camera around you both looks good and gives you a new perspective of your surroundings. The audio suites the atmosphere and thematic design as well. This all sounds promising, and it is to a point, but there are so many flaws I found myself not enjoying any of my time with LA Cops. The enemy AI is very inconsistent. Firing your weapon can alert guards to your presence, but only sometimes. A guard close to you, only separated by a wall, will have no reaction while a guard a considerable distance away will come running. Approaching a guard near a door is a bad idea too, you cannot shoot through them and when they wildly swing open (sometimes disappearing) they obscure your vision. Guards will often have shot you down before you can see them from behind the door. There seems to be little logic with guard's health levels. Some will go down with one hit, some with two. I've tried to work out if there's a pattern (larger guards take two hits, smaller take one, for example) but there isn't any consistency. This is tremendously frustrating when you run into a room, take aim, shoot the guard who then is barely affected and shoots you dead in one. That careful planning and timing made redundant. Some of the level design has its problems as well. The camera is pretty tight and although you can rotate it, some of the rooms are large enough for you to be unable to see their entirety. You can zoom the camera out with the d-pad but not enough. At the end of one of the floors in the Skyscraper level I was frequently shot by an enemy I could not see (admittedly this was before I learnt you could zoom the camera out). Infuriating. One of the newer levels starts with a room with two guards at the other end which you can only just about see when fully zoomed out. It would be really helpful to have a free camera available in levels; not just to see enemies that are slightly out of view, but to look across the whole level to plan your actions in advance. I found some of the gunplay to be a little sluggish. 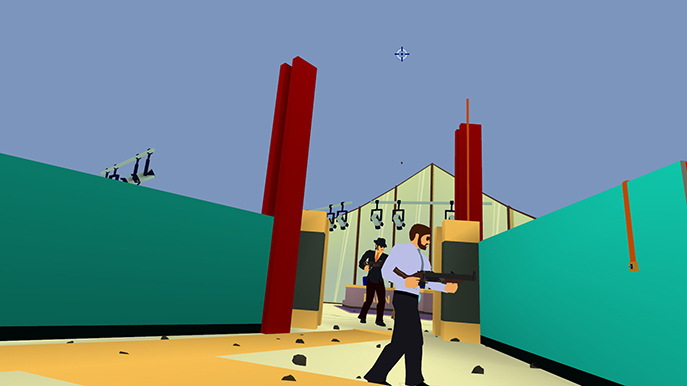 You have a pistol each at the start of the level and it feels like there's a slight input delay in firing. This has led to a guard shooting me first, when I'm of the opinion that I had pressed the trigger in time. It was from this frustration that I discovered perhaps the biggest flaw in LA Cops so far: you can complete all the levels without firing your weapon. Though your companion doesn't move independently, they can shoot and they shoot ridiculously well. If you run into a room populated with guards and immediately switch to the other character, the character you switched from will open fire and kill every guard within seconds. I found my companion succeeded in this around nine out of every ten times; they occasionally died, but far more often that not they wiped out everyone they saw. I went through all but the first floor in the second level using this technique and was provided with no challenge. I know this is not in the spirit of the game, but the inconsistent enemy AI will frustrate you enough that you'll employ this at some point. It is still early for LA Cops but there are many improvements that need to be made before I can recommend it. There are currently three levels with about an hour playtime in total (more or less depending on your completion speed). Most of my time was in the Skyscraper level; the two new levels took a total of twenty minutes for me to play through. There is promise here. The visual design, audio and concept are great. Since Hotline Miami I have become a fan of the genre and will gladly play more. It just feels like everything needs to be tightened. Enemy AI plays a big part; I've had occasions where a guard is in the opposite end of a room from me, looking straight at me, and ignoring me completely. The gunplay needs to be more precise, with consistent enemies, a free camera, better use for your companion (the exploit I mentioned needs removing) and fairer levels. I must admit I was hugely disappointed with LA Cops after looking forward to it. I can't recommend it at the moment but will take another look when it is either closer to completion or released. There is potential and it looks great but the numerous design flaws, bugs and inconsistent AI make your time with LA Cops nothing but frustrating at the moment.